Ireland legend Ray Houghton says that players must take more responsibility for the national team's current form, as pressure increases on manager Martin O'Neill following another disappointing performance. Ireland earned a 0-0 draw against Denmark in Aarhus on Monday to finish off their UEFA Nations League campaign, but struggled to create chances in what was the team's fourth straight game without a goal. O'Neill's side were relegated from their group in the new competition after two defeats and two draws and now face into a potentially difficult draw for the Euro 2020 qualification campaign. 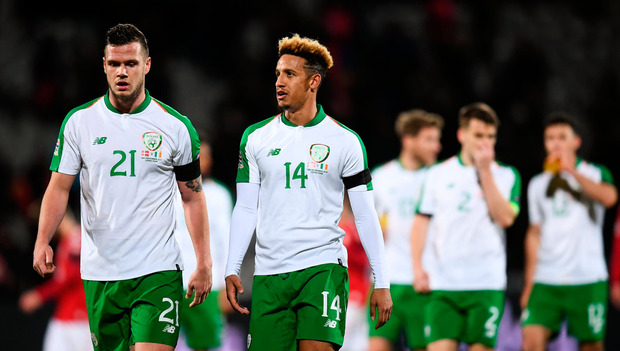 O'Neill has come in for criticism for the slump in form since losing 5-1 at home to Denmark in last year's World Cup playoff, but former Ireland international Ray Houghton thinks that the players aren't helping the manager. Speaking to RTÉ, Houghton said that the players need to demand more of themselves on the ball, and shouldn't be hiding behind criticism of the manager. "When I’m watching the game I can tell who wants the ball and who doesn’t and players are making angles to receive it," Houghton said. "What you want in football is options, the more options you have, the easier it is for the player on the ball. "We didn’t have that last night. We’ve got lads running around but what we need is a bit more structure when we’ve got the ball to get ourselves higher up the field. "That’s down to the players, it’s not just down to the manager, confidence comes from within. As a player you’ve got to take responsibility, you’ve got to be big enough and brave enough to make things happen. "I’m sure they haven’t been doing things in training solely on defending. There is an attacking option as well that they should be looking at and it’s up to the players to go out that and try that as well. "Just lumping balls forward to O’Brien is not going to be the way forward for us." Houghton added that collectively, the Ireland manager and the players need to work together on a more effective attacking strategy. "The worry is the lack of creativity," Houghton said. "We’re not creating opportunities, we’re not a goal threat at the moment and we didn’t even have a shot on target in 90 minutes last night. "So that’s got to be something the manager is looking at and how we’re going to improve upon that because it’s two-sided football. "When we don’t have the ball we’re fine, we get back into shape, everyone’s working hard and you can’t fault their attitude and commitment. But it’s what we do when we’ve got the ball and that’s the worry at the moment. "There’s a lack of confidence, players don’t want to get on the ball, no-one’s being courageous to make things happen. Our strikers aren’t holding the ball up because they’re not getting much service and we’re not getting high up the field."